This story was updatedat 5:31 p.m. EST. WASHINGTON --- Space Exploration (SpaceX) Technologies' third attempt to launch the Falcon 1rocket on its maiden flight has been pushed back roughly 24 hours to Friday, Feb.10 to allow for more tests. "We'repreparing to stop and test just to verify that everything is running at 100percent," said Elon Musk, founder of the El Selgundo,California-based SpaceX, in a telephone interviewfrom the firm's Kwajalein Atoll launch site on thePacific Ocean. "It's a reliability measure." SpaceX spokeswoman Dianne Molina saidTuesday that Friday's launch window extends from 4:00 p.m. to 10:00 p.m. EST(2100-0300 Feb. 11 GMT). "As an additional reliability measure, SpaceX will conduct a full test of vehicle systems,including initiating the flight countdown autosequenceand briefly firing the main engine on the launch stand," SpaceXannounced Monday in a statement posted on its website. "This test will takeplace Thursday, February 9 (Californiatime)." "Assuming we don't see anythingcritical, then we'll proceed for a Friday launch,"Musk added. 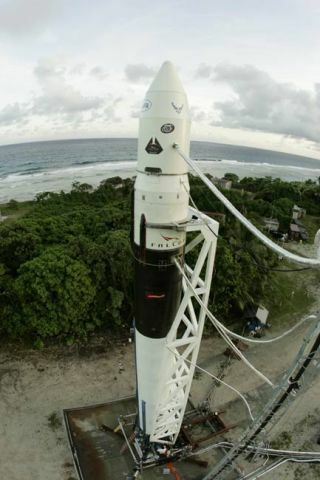 SpaceX has made two previousattempts to launch the Falcon 1 from the company's private launch facility on Omelek Island in the KwajaleinAtoll region of the equatorial Marshall Islands. A Dec.19 attempt, the most recent, had to be called off when the Falcon 1's firststage sustained structural damage while being partially drained of fuel duringa countdown hold due to high winds. SpaceX has since replaced the damagedfirst stage with a new one sent from El Segundo. SPACE.com's Tariq Malik contributed to thisreport from New York City.